This example demonstrates how to detect and highlight object edges in a video stream. 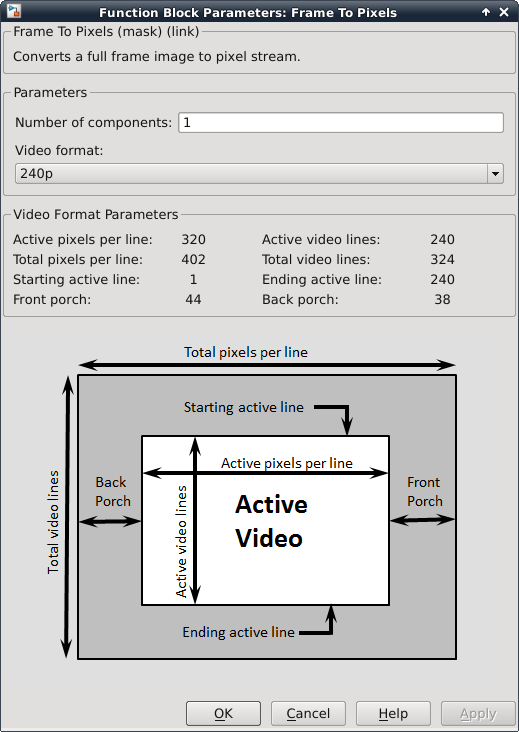 The behavior of the pixel-stream Sobel Edge Detector, video stream alignment, and overlay, is verified by comparing the results with the same algorithm calculated by the full-frame blocks from the Computer Vision System Toolbox™. This example model provides a hardware-compatible algorithm. You can implement this algorithm on a board using a Xilinx™ Zynq™ reference design. See Developing Vision Algorithms for Zynq-Based Hardware (Computer Vision Toolbox Support Package for Xilinx Zynq-Based Hardware). The EdgeDetectionAndOverlayHDL.slx system is shown below. The difference in the color of the lines feeding the Full-Frame Behavioral Model and Pixel-Stream HDL Model subsystems indicates the change in the image rate on the streaming branch of the model. This rate transition is because the pixel stream is sent out in the same amount of time as the full video frames and therefore it is transmitted at a higher rate. The following diagram shows the structure of the Full-Frame Behavioral Model subsystem, which employs the frame-based Edge Detection block. Given that the frame-based Edge Detection block does not introduce latency, image overlay is performed by weighting the source image and the Edge Detection output image, and adding them together in a straightforward manner. One frame of the source video, the edge detection result, and the overlaid image are shown from left to right in the diagram below. It is a good practice to develop a behavioral system using blocks that process full image frames, the Full-Frame Behavioral Model subsystem in this example, before moving forward to working on an FPGA-targeting design. Such a behavioral model helps verify the video processing design. Later on, it can serve as a reference for verifying the implementation of the algorithm targeted to an FPGA. Specifically, the PSNR (peak signal-to-noise ratio) block at the top level of the model compares the results from full-frame processing with those from pixel-stream processing. The Pixel-Stream HDL Model subsystem is shown in the diagram below. You can generate HDL code from this subsystem. Due to the nature of pixel-stream processing, unlike the Edge Detection block in the Full-Frame Behavioral Model, the Edge Detector block from the Vision HDL Toolbox™ will introduce latency. The latency prevents us from directly weighting and adding two images to obtain the overlaid image. To address this issue, the Pixel Stream Aligner block is used to synchronize the two pixel streams before the sum. To properly use this block, refPixel and refCtrl must be connected to the pixel and control bus that are associated with a delayed pixel stream. In our example, due to the latency introduced by the Edge Detector, the pixel stream coming out of the Edge Detector is delayed with respect to that feeding into it. Therefore, the upstream source of refPixel and refCtrl are the Edge and ctrl output of the Edge Detector. While building the streaming portion of the design, the PSNR block continuously verifies results against the original full-frame design. The Delay block on the top level of the model time-aligns the 2-D matrices for a fair comparison. During the course of the simulation, the PSNR block should give inf output, indicating that the output image from the Full-Frame Behavioral Model matches the image generated from the stream processing Pixel-Stream HDL Model. The updated will be propagated to the Threshold field of the Edge Detection block inside the Full-Frame Behavioral Model and the Edge Detector block inside Pixel-Stream HDL Model/Edge Detection. The value will be propagated to the Gain1 block in the Full-Frame Behavioral Model and Pixel-Stream HDL Model/Image Overlay, and the value of goes to Gain2 blocks. Closing the model clears both variables from your workspace. In this example, the valid range of is between 0 and 256, inclusive. Setting equal to or greater than 257 triggers a message Parameter overflow occurred for 'threshold'. The higher you set the , the smaller the amount of edges the example finds in the video. The valid range of is between 0 and 1, inclusive. It determines the weights for edge detection output image and the original source image before adding them. The overlay operation is a linear interpolation according to the following formula. overlaid image = alpha*source image + (1-alpha)*edge image. Therefore, when , the overlaid image is the edge detection output, and when it becomes the source image.